The rescue team in Evergreen got a call to rescue a 5-year-old, 120 pound patient over the weekend - the victim was a dog named Kato. Evergreen Fire Rescue had a different kind of rescue call over the weekend. A stranded victim on the Maxwell Falls trail was described as 5-years-old, 120 pounds, dehydrated and very hairy. That victim was a dog, named Kato. The rescue team tells 9NEWS they weren't totally surprised to get a call on Maxwell Falls. Some areas are steep, and it's a rigorous workout. When the crew heard "dog in distress" over the radio, they didn't hesitate to respond. Kato, the Great Pyrenees, was alert, but exhausted and probably dehydrated. 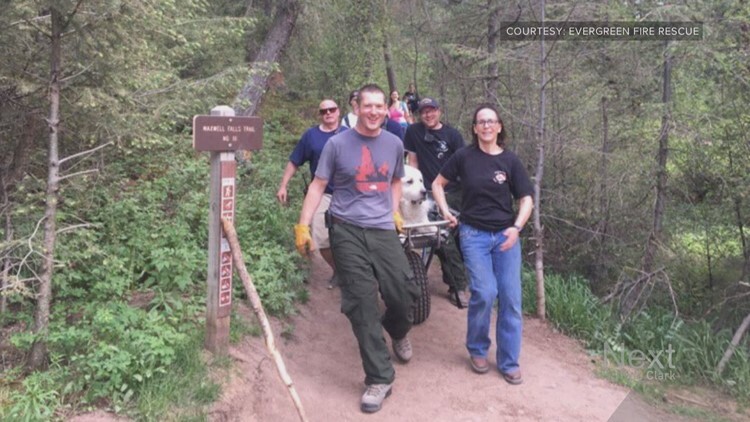 He just couldn't finish the hike on his own, so his humans reached out to emergency crews. The team carried Kato out on a stretcher - the same old stretcher they use to save people. Stacee Martin, the public information officer for Evergreen Fire Department, said the family will not have to pay for the rescue because it is made up exclusively of volunteers. "We choose to help animals," Martin said. "Doesn't matter if a it's a horse stuck in the mud, owls that fall out of the nest ... this is something that the community supports." Martin said it's not uncommon to have to rescue animals year-round, although it is less common for it to be a dog on a hike. "Sometimes in the winter you'll see more with critters falling through the ice," she said. "It ebbs and it flows."